Written by: Joe Walker on July 20, 2016. Nepal is once more affected by the perils of nature. In the end of July, devastating floods have ripped through the country. See the full story here. A catastrophic earthquake ripped through the South Asian country of Nepal in the Himalayan mountain range, resulting in thousands of casualties, loss of homes and the irreversible damage of many of the country’s designated UNESCO World Heritage sites. The Ghorka earthquake, as it became known, was recorded as having a magnitude of 7.6 on the Richter scale, making it the worst natural disaster to strike Nepal since the 1934 Nepal-Bihar earthquake. The epicenter of the quake was rooted in the Ghorka district, roughly 50 miles west of Kathmandu – the country’s capital and most densely populated area. The devastation was immense and the toll on human lives breathtaking – over 8,500 people lost their lives (including 21 in a quake-caused avalanche on Mt. Everest), an additional 16,000 injured and hundreds of thousands were left without shelter. As the casualties began to mount, a small charitable organization from the nearby country of Bangladesh was beginning to mobilize. 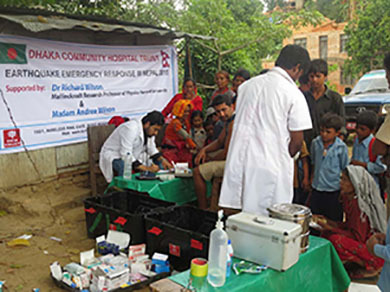 The Dhaka Community Hospital Trust (DCH Trust) is a trust-owned non-profit organization which provides healthcare and emergency services for underprivileged people in the region, primarily in Bangladesh. Established in 1988, DCH Trust also specializes in disaster relief and has ample experience in implementing post-disaster rehabilitation programs. As a result of DCH Trust’s quick mobilization and the generosity of international donors, the team was able to make a significant impact in aiding the plight of over 8,000 Nepali citizens. Apart from disaster relief, DCH Trust programs focus on arsenic and safe water treatment, cleft lip & palate repair as well as rural, industrial and school health initiatives. DCH Trust also runs a community hospital in the Bangladeshi capital of Dhaka. In the past, DCH Trust has partnered with CAF America and other reputable organizations such as the Harvard School of Public Health, Boston Children’s Hospital, AusAID, World Bank, UNICEF and many more. The Dhaka Community Hospital Trust is headquartered in Dhaka, Bangladesh.